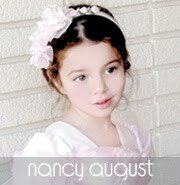 Baby pageants are truly exciting; every parent wants to prove how adorable their little baby is and here at NancyAugust.com we have the best collection of baby pageant dresses to provide that much needed proof! Our collection of baby pageant dresses beats the others; our selection is hand-picked by our experienced buyers who are always on the look-out for the most beautiful and stylish dresses. We only add that dress to our collection if we believe the dress is a winner! For a winning dress, we make sure that the dress, including fabric and craftsmanship is of high quality, the styles are trendy, and the price is right. We've put together an amazing collection full of different colors, silhouettes, details, trims, and more! We understand that getting your little baby into pageants is stressful on the wallet. Sometimes you have to hire a professional photographer to create a portfolio and occasionally there is an entrance fee for the contest. A bunch of other little odds and ends cost mommy and daddy a lot of money. Choosing baby pageant dresses may not be as simple as it sounds. Depending upon the style and design of the dresses you purchase, you can end up spending a small fortune. Through our website, you can see that although we have some of the best styles of high quality dresses in the business, our lowest price guarantee is something we proudly advertise. 1.) Measurements. Measure your baby. Many of the products on our website have their very own size chart. This will help you find the best size dress for your baby. Does this pageant require standing or walking? Then, it would be really, really important to know your baby's length so she doesn't have a little mishap! 2.) Season. What season will this pageant be happening in? The judges may be picky so it's good to choose a dress in which the colors and style are on trend for the season. Although a rich, burgundy dress will look fantastic and charming for the holiday, if your baby wore that for a spring pageant it may come off as dreary. Browse the internet or fashion magazines for style tips and color trends! 3.) Personality. Nothing is better than matching a dress to a baby. She will feel more comfortable in a dress that relates to her personality and characteristics. Nothing is worse than a fussy little one in a dress she doesn't feel comfortable in. Is she bright and bubbly? Calm and classy? Spunky and fun? How about a sweet princess? We have a dress to match any of her personality traits or even a combination of all of the above! 4.) Customization. Not finding the perfect dress? Make your own! Many of our dresses have removable waist sashes and flower pins. Be sure to check out our accessories collection for more options in waist sash fabrics and colors, as well as flower pins! There you can find shoes, socks, tights, jewelry, headbands, and more. It's all there to help you create the perfect pageant outfit! 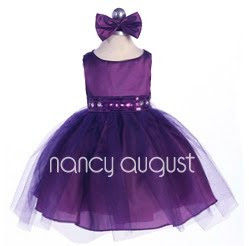 Purple Baby Dress with Rhinestone Tulle, item: LA548B-PUR. This is unconventional as far as typical pageant dresses go, but maybe you are willing to take the risk! With such a vibrant and breathtaking shade of purple, your baby will definitely stand out from the rest of the competition. A classic sleeveless bodice leads to a beautiful bejeweled waistband adorned with rhinestones, beads and sequins. The waistband then leads to an adorable ballerina style skirt made of layers of tulle and supported by crinoline. Your baby will look charming, graceful and full of personality in this brilliant purple dress! Good luck my future pageant winners!!! Look at Luz in her Blue Party Dress!